If the transition from late winter to early spring were to be a color, that color would be yellow. 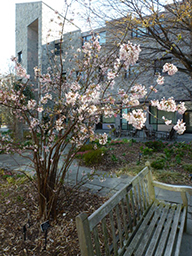 Jasminum nudiflorum, Hamamelis, Chimonanthus, Forsythia, and Mahonia all greet spring with golden blossoms. There is always one exception. 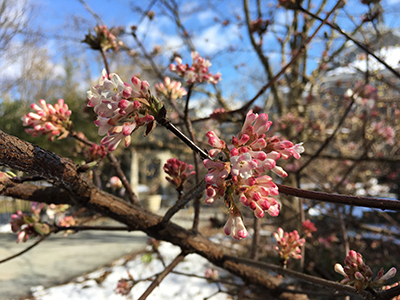 Viburnum x bodnantense, with clusters of pink blooms akin to the rosy cherry blooms that are a few weeks to come, bucks the golden color theme. Viburnum x bodnantense is a hybrid cross between V. farreri and V. grandiflorum and named after Bodnant Garden from which it originated. The initial crosses, made in 1933 by Charles Lamont at the Royal Botanic Garden, Edinburgh, yielded nothing deemed worthy of naming. Later crosses gave rise to the three cultivars we know today: ‘Charles Lamont’, ‘Dawn’, and ‘Deben’. ‘Charles Lamont’ bears the brightest and pinkest flowers and sports the largest leaves of the trio, an influence of the V. grandiflorum parent. ‘Dawn’ crossed by Charles Puddle, the head gardener at Bodnant Garden, in 1934 is the most widely seen and available cultivar in the United States. Flowers are pink with darker pink, almost purple anthers. A chance seedling, ‘Deben’ produces the largest flower clusters. It is suspected that V. farreri ‘Candidissimum’ is a parent. Buds open a soft pink and gradually fade to white. Open flowers on ‘Deben’ show the greatest response to cold injury of the three cultivars (flowers turn brown). With subtle variations of flower color and leaf size, all three grow to the same proportion, roughly 8’ tall and 10 to 15’ wide. The fragrant flowers appear on naked branches, often beginning at the end of February, and open over a period of time. 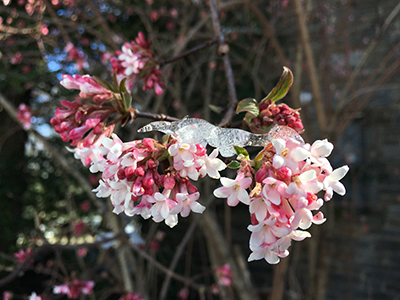 Open flowers are susceptible to freezing temperatures, though buds are frost-proof, and continue the floral display. Siting with southern exposure or near a building provides some protection from frosts. Flowers on two specimens of the cultivar ‘Dawn’ along Worth Hall first opened on February 17th. Plants are still in flower nearly two months later. Serrated foliage 2” to 4” long and 1” to 2” wide unfurl with bronze hues, then change to all green. Fruit, when produced, matures red in summer and then turns black. Fragrant pink flowers in late winter earn V. x bodnantense extra points; it then receives demerits for its off-season habit. Gangly, leggy, and cumbersome are descriptors that come to mind when describing habit and form. While not a specimen plant or one for pride of place (in my opinion) it is certainly worthy of inclusion should space allow. Provide neighbors – ones that can hide its bare legs – and offer interest while V. x bodnantense retires to the background. The stems make great support for climbers such as clematis and annual summer vines. Plant near the dripline of the shrub and use cut branches to help get the vine started. My personal favorite specimen is in the Cosby Courtyard. The surrounding building provides protection and traps the fragrance. The various paths that cut through the space guarantee that you’re bound to catch a whiff. The plant is center stage for several weeks, then as it fades, other plants step into the spotlight. I really like this shrub, as I get tired of all the gaudy yellow! We plant small rhodies in front of it to hide it’s legs, but the idea of a clematis twining through it is wonderful! Thanks for the idea. Dear Wendy, I am glad you were able to find inspiration in this article. 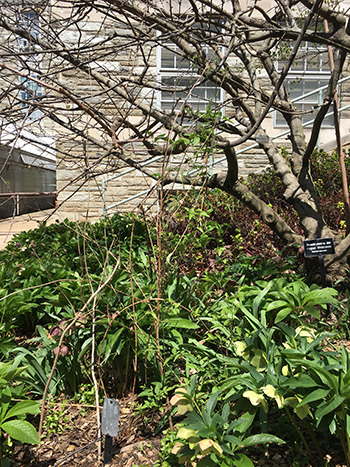 The gardening staff has tucked clematis all over campus using this same idea.